This production machine is commonly referred to as a turn/mill center with a 10” chuck on main spindle, 6” chuck on sub-spindle, 3” bar capacity, live tooling and Y-axis. It can combine multiple operations into one operation and make parts complete in 1 operation. It's advanced cutting abilities provide highly accurate turning solutions. Watch this lathe machine at work now! This production machine is in the screw machine class of CNC lathes and also referred to as a turn/mill center. It is for production bar work only. This lathe machine has a 12’ barfeeder to supply material and a 42mm or 1-5/8” capacity on main and sub-spindles with live tooling and a Y-axis. The video of our Miyano BNA42-MSY, CNC lathe machine shows the machine turning, threading, grooving and transferring to sub spindle, then cutoff, facing and milling the slot in the head for a screw driver bit, and finally the part ejection. This screw part used to be done on 3 different machines, requiring 3 setups and 3 operations. With our new, advanced technology component parts can now be made on one machine, reducing production times, increasing quality and reducing pricing. Vertical Machining Centers Our Vertical Machining Center (VMC) utilizes break-through technology for Computer Numerical Control Machining. Vertical Machining uses a vertically-oriented spindle so tools stick straight down from the holder. Then they cut across the surface of the work piece. VMC can hold tight tolerances on challenging parts with excellent speed and consistent accuracy. Read more about our Vertical Machining capabilities now. CNC Turning Centers Our CNC Turning Centers provide a stable platform for high quality and high performance machining of small to medium diameter parts. Once the design file for the part is uploaded, the machine will continually turn out precisely machined parts with ease of setting, repeatability, simple operation and precise accuracy. Read more about our CNC Turning Centers now. Production Sawing Equipment Production Sawing Equipment delivers high production cutting of a wide variety of materials. Precision cutting can be provided for rounds, squares, shapes, flats, bars, tubes or extrusions. Along with production sawing, we can also offer facing, chamfering, centering and end deburring. Read more about our Production Sawing Capabilities now. CNC Milling Machines CNC milling machines is used for complex shaping of metal or other solid materials. It performs many different operations, including slot cutting, spotting, drilling, face milling, side milling, boring and tapping. An end mill rotates on a spindle axis with a movable table below which holds the work piece. The machine can be operated either manually or with computer numerical control. Milling Machine at Work Now! Drill Presses Drill presses assure fast, accurate and stable drilling of holes into metal. Also, its powerful motor makes it easier to drill faster with smaller bits. Under manual or CNC operations, our drill presses provide accurate and economical drilling. Learn about our drill press machining capabilities now. Grinders A grinding machine uses abrasive wheels for cutting. Grinding is used to finish work pieces which must be smooth on the surface but highly accurate in shape and dimension. Grinders deliver extreme accuracy while removing metal. The head is finely controlled. Since the work piece is heated, the grinder uses a coolant to keep the work piece within tolerance. Learn more about our grinding machining capabilities now. Lathes: Turret & Engine Engine Lathes can be used for many operations and are small enough to be easily moved. A skillful operator with an engine lathe can do virtually any type of lathe work. A turret lathe or special purpose lathe is designed for high production applications or to produce specialized parts. Learn about Jones Tools & Manufacturing's lathe machines now. Vibratory Deburring A Vibratory finishing machine has an open tub set on springs. It is filled with media and parts. The drive system then creates a vibration. The speed or degree of vibration is carefully controlled to assure accurate finishing of the parts. Learn more about vibratory deburring now. We augment our machinist’s talent by constantly upgrading our production capabilities, enabling them to function in a cutting-edge facility and assuring you of a component part to your exact requirements. From initial design all the way to actual delivery, we meet the highest standards for every part. Our component part engineers have the skillset to solve design challenges quickly. Furthermore, we work faster because of our broad range of practical manufacturing experience. We will meet your delivery requirements, helping you to maintain your production schedule. 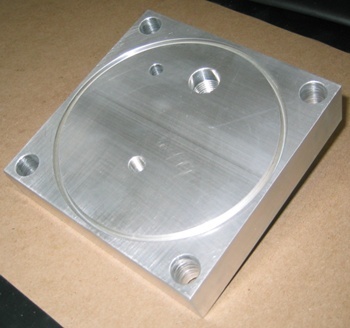 Our expertise in CNC Manufacturing offers many advantages. The most important advantage is that our process is incredibly more precise than manual machining. Check out our FAQ to learn even more about CNC Machining from Jones Tools. Jones Tools & Manufacturing offers a vast selection of finishes, though some metal finishing processes cannot be done in-house. We provide special processing for you to ensure we always deliver a high-quality, finished product. We strategically outsource our finishing and plating services to better serve our clients with higher quality zinc plated component parts. Jones Tools has decreased lead times by 50% while providing more uniform finishes for zinc plating required parts. Service and dedication is what generates a leading component part manufacturer. Advanced machining equipment provides the unmatched level of product quality Jones Tools & Manufacturing unfailingly delivers. Jones Tools & Manufacturing utilizes high-grade milling and machining equipment. Our machines support our success, therefore we make certain to purchase only the best. Contact our milling machine specialists today with your custom component part request.